With merely a week to go before we get to experience Seth Rogan‘s take on Christmas, Columbia pictures have just released the final red band trailer for the upcoming holiday smash. Starring the likes of Joseph Gordon-Levitt, Lizzy Caplan, Anthony Macki and Rogen respectfully, the film is sure to ring in the season in the best of ways. 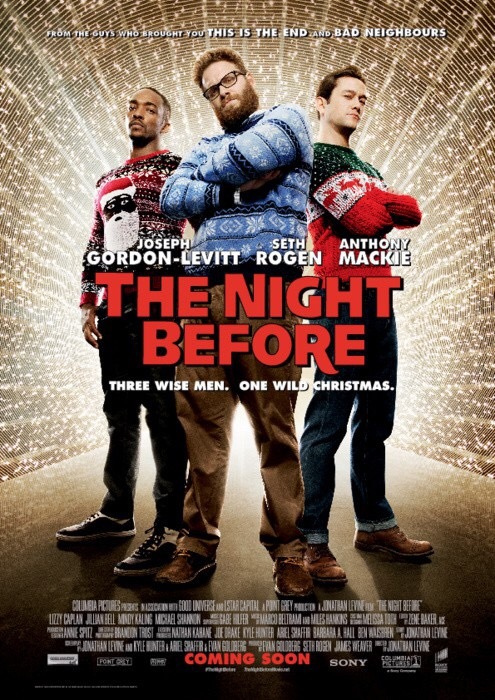 The film tells the story of three best friends who reunite in New York City for their annual Christmas Eve debauchery. They set out to find the holy grail of Christmas parties, since their yearly reunions may be coming to an end, as the men grow older. Featuring an abundance of cameos from Kanye West to Mindy Kahling to none other then Miley Cyrus. Check out the trailer below and catch the sure to be classic on Novemer 19th. Posted in Film and tagged film, movie, seth rogen, the night before. Bookmark the permalink.